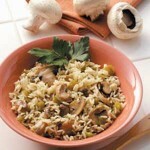 Rice cooked with mushrooms, garlic, onion and zesty spices. Boiled rice recipe for the beginners. A good and healthy snack for kids.